A recent report published by Infinium Global Research on cryostats market provides in depth analysis of segments and sub-segments in global as well as regional markets of cryostats market. The study also highlights the impact of drivers, restraints and macro indicators on the global and regional markets of cryostats over the short term as well as long term. 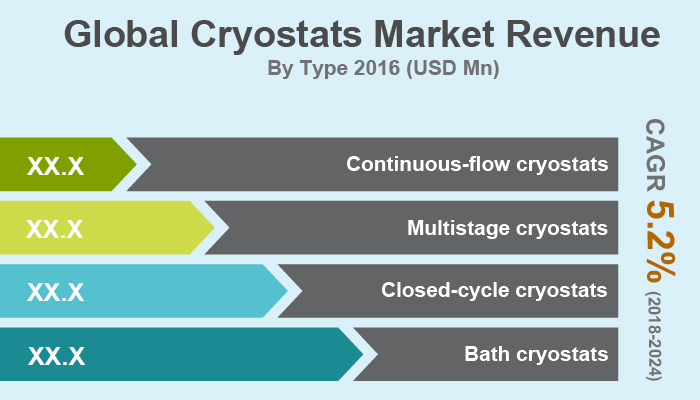 The report is a comprehensive presentation of trends, forecast and dollar values of global cryostats market. According to report the global cryostats market is projected to grow at a CAGR of 5.2% over the forecast period of 2018 - 2024. The report on global cryostats market covers segments such as type, cryogen, and industry. The type segments include bath cryostats, closed-cycle cryostats, multistage cryostats and continuous-flow cryostats. On the basis of cryogen the global cryostats market is categorized into nitrogen, helium and others. Furthermore, on the basis of industry the cryostats market is segmented as biotechnology, forensic science, energy & power, aerospace, healthcare, marine biology and metallurgy.